Volta requires an audio interface or D/A converter with DC-coupled analog outputs to be able to send control voltages to your analog synthesizers. The Volta User Guide lists approved MOTU audio interfaces. If you're using an audio interface or D/A converter from a different manufacturer, you should contact the manufacturer to find out whether its analog outputs are DC-coupled. If you are familiar with measuring DC voltages, you can use practically any voltmeter or multimeter to test a device's outputs for DC coupling. You should be familiar with using a voltmeter and standard electrical safety procedures before proceeding. First make sure that the meter is set to measure DC voltage. If your meter does not have an auto-ranging feature, you will need to manually select the voltage range to measure. Analog outputs on professional audio gear will typically produce between ±2VDC and ±9VDC if they are DC-coupled, so set the measurement range accordingly. TRS stereo tip sleeve Stereo headphones outputs are typically stereo TRS jacks. With a TRS-to-dual TS adapter cable, both channels of the output jack can be used for CV. TRS (bal.) tip sleeve Use a TRS-to-TS adapter cable. The TRS plug's ring conductor should be left unconnected. XLR pin 2 pin 1 In a standard XLR output, pin 1 is ground and pin 2 is positive. Some XLR outputs may be wired with pin 1 to ground and pin 3 to positive. In a compatible sequencer application, instantiate the Volta plug-in. One of Volta's slots must be routed to the interface output that you want to test. Refer to Chapter 3, "The Volta Plug-in", in the Volta User Guide for specific details about how to configure this routing in the sequencer application. Add a ramp control source to the slot you're using. It will be labeled Ramp 1 in the Volta window. Using the sequencer's automation insertion tools, insert a Ramp 1 automation point with a value of 1.00 at the beginning of the sequence. This will cause the hardware output to produce its highest possible DC voltage. Observe the voltmeter's voltage reading. If the meter is being overloaded because the incoming voltage is out of range, adjust the measurement range up. If the meter continuously reads 0VDC and you are sure that Volta is generating a signal to the appropriate hardware output, then you should adjust the meter's measurement range down. When an output is DC-coupled, the meter should display a steady DC voltage measurment (such as +4.5VDC). If the meter can not make a steady measurement, then the output being measured is not DC-coupled. It is blocking very low frequency and DC signals, which means that it is not useable as a CV output. Download this Volta test audio file. 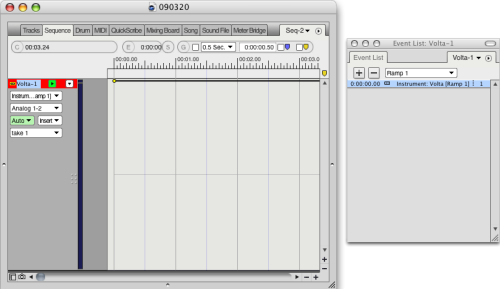 In a compatible sequencer application, import the downloaded audio file and add it to a mono audio track. Assign the output of the audio track to the analog output you wish to test. Play the sequence. The test file will cause the hardware output to produce its highest possible DC voltage. Then follow step 5 above. These tables summarize the maximum voltage and octave range (assuming 1 volt/octave) for each MOTU audio interface, as well as the type of cable needed, These are approximate values, as voltage may vary from interface to interface.